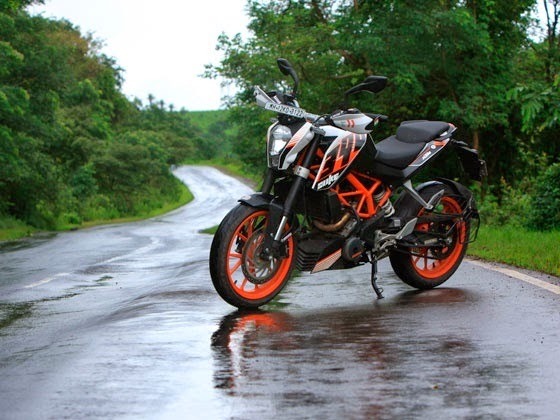 KTM Duke 390 has great bike profile. Maybe it's an exaggeration to say that the KTM Duke 390, which should land in some countries in May, is the naked missing in our market. But the Austrian model factory will occupy a gap between bikes 250 / 300cc and larger 500cc. Qualities to it does not lack. His single-cylinder engine produces 44 hp good of maximum power, the lattice framework ensures low weight, the suspension set has decent specifications of larger motorcycles and the brake system - the drive on two wheels - has ABS. The impact that the Duke 390 may (or may not) have on average nakeds segment will depend on your final price. The model will be assembled by the CKD system in the factory of Dafra in Manaus (AM), and to be competitive, can cost more than 300cc models, such as the Kawasaki Ninja 300, but will have to stay below the bicilíndrica Honda CB500F - both with ABS. According to market sources, the Duke 390 will be priced between US$ 6,700. While the model does not reach the country, went to Thailand at the invitation of KTM, for an international launch event of the whole line 2015 naked bikes the Austrian factory. In the 390 model there are Duke 125, 200, 690 and Super Duke 1290R. Models 200, 390 and 1290R are already confirmed to come to Brazil. The Duke 390 brings the same principles of the whole family: be a motorcycle without fairing, light, agile and with plenty of torque. The visual identity of the line was also maintained. A minimalist design, marked by angular lines, the elongated headlight and with the engine and the frame in apparent lattice. The first part of the test was to experience the Duke 390 the streets of the Khao Yai National Park, 200 km north of Bangkok. When assembling the model, the legs fit well in slender tank shapes and feet easily reach the ground because the seat is only 80 cm from the ground. Draws attention also good finish Duke 390: Support and aluminum handlebars are difficult items to find in this size bikes. The riding position is typically a naked with sporting aspirations: leaning forward slightly and knees flexed little trunk. The handlebars are wide and makes the elbows are open in a good position to 'attack' turns and control of the bike. Note also the low weight of 390 cc model, which even shares the same trellis frame in steel Duke 200. Thus, the bike weighs 139 kg dry, only 9.5 kg more than her younger sister but with a much larger motor and potent. The single cylinder, double camshaft (DOHC) and liquid cooling had diameter and increased travel to reach 373 cc capacity. Thus, the increased propellant produces 44 horsepower maximum power to 9,500 rpm. To get an idea of ​​what this means in practice, the Duke 390 weighs 41 kg less than the Honda CB 500F and offers almost the same power as the bicilíndrico Japanese naked, which has 50.4 hp. Upon awakening, the single-cylinder emits a nice growl to hear. Vibra as other engines with this architecture. 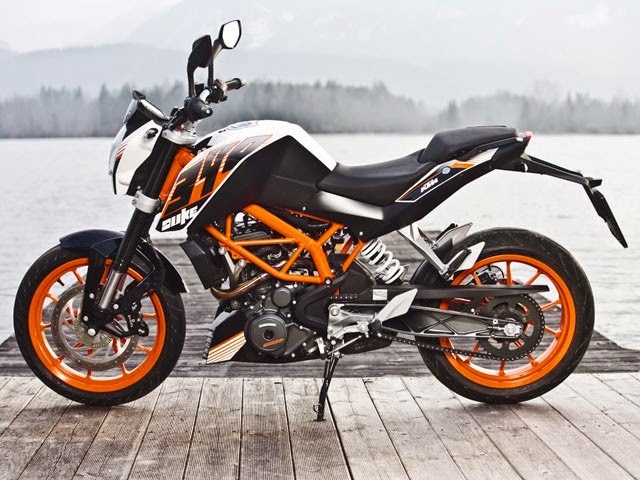 The hydraulic clutch is not, however it is soft and easy to engage - as tested was not equipped with the sliding clutch according KTM should wear Duke 2015 model 390 that will be mounted in Brazil. Hitch the first of the six-speed exchange with ease, and already in the output, impresses the good torque from low revs, another characteristic of a cylinder engines. The acceleration is impressive, the spins skyrocket thanks to the double camshaft in the head and the engine seems full even from 5,000 spins. The marches have a long relationship, but it still does not seem to lack power to the engine push this lightweight naked. Even in fourth and fifth gears, up the mountain towards the mountains of Khao Yai National Park, the 390 Duke responded well to the throttle and required few downshifts. The torque, which reaches a maximum of 3.57 kgf.m only 7,250 rpm, seems to be enough to push this lightweight naked as of 3000 turns. Quick direction changes are so easy to perform that even seems that the Duke 390 is a smaller bike, such facility to avoid obstacles or point the front assembly to bypass curves. Suspensions - inverted fork with 43mm tubes, on the front, and monoshock fixed directly on the swingarm - are the WP and both have 150mm travel. Although not offer adjustments are set to merge comfort and rigidity. Varei a small bump and although he felt the jolt, the suspensions did not hit limit. In more sharp turns, the cycling group sent security to tilt enough to 390 in the corners. 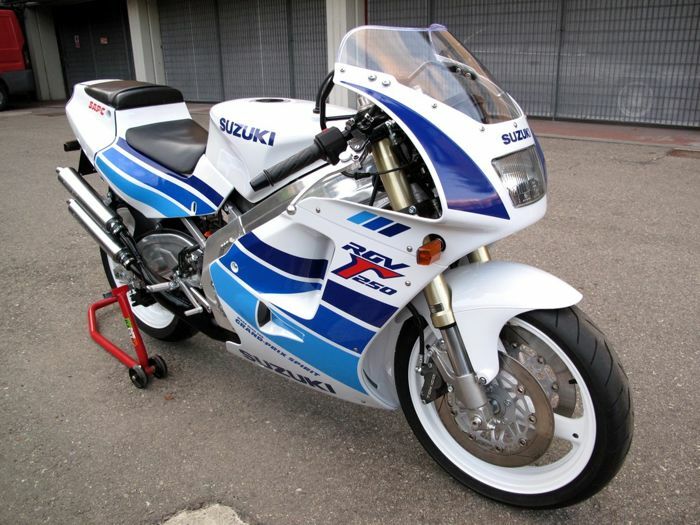 But it was in Bonanza track, also in Thailand, the Duke 390 showed his more sporting character. The light-alloy 17-inch wheels shod with Pirelli Diablo Rosso II tires, the measures 110/70 (front armrest.) And 150/60 (Back. ), Allowed to throw 390 in the curves to the pedals scrape the pavement. The acceleration and braking of the single cylinder were further evaluated in a locked Thai circuit. In curves outputs, the engine responded with force in second or third gear. On the line, the turns came to 10,000, 11,000 rpm and the shift light lit in the compact and functional touch panel. Reach the speed of 145 km / h (in the speedometer) in fifth gear at the end of the straight. KTM Duke states that can reach 160 km / h top speed. The brakes are good your service, after the bike is light and the set gets to be oversized for the model. In front, 300 mm diameter disc and radial clamp with four pistons, manufactured by ByBre, a subsidiary of Italian Brembo, but manufactured in India. Behind, a disc 230 mm with floating caliper of a piston. To give you an idea, the Duke 690 and heavier, uses a 320 mm disc at the front. The response is immediate, but without scaring, and to effectively Duke 390. Not on the track, showed fatigue, due to the flexible covered with steel mesh (Aeroquip). On the street, you can still count on the aid of the ABS system 9M two channels developed in partnership with Bosch. Only in exaggerated situations, forcing the rear brake pedal the system went into action on the roads. On the track, it was possible to turn it off via a button on the panel. But as soon as the key is turned off the system back into operation. A requirement of European and American law, since the model is sold worldwide. Although weight and dimensions of smaller models, since sharing frame, wheels and up to 11-gallon tank with the 200cc model, the Duke 390 features a performance worthy of bigger bikes. Behind this average naked, there is a "big" bike. The propellant has good torque and enough power. The cycling set ensures stability at high speeds and cornering agility. The equipment also put on motorbikes level with greater capacity: ABS brakes as standard, which can be turned off; completely digital panel with trip computer indicated that consumption of 21 km / her a good pace. But anything worth the long list of qualities if the price gets too above practiced in other markets. 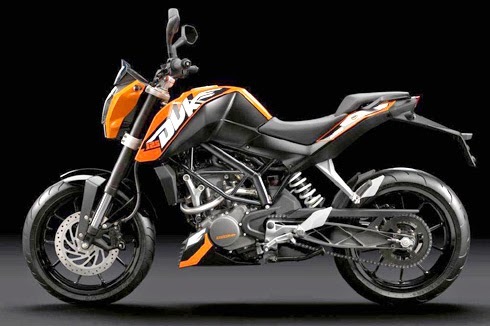 The production model is expected to begin in May and the model should reach the KTM stores and Dafra dealers in June. The dealers bet on a final price of around £ 25,000. In Europe, the KTM Duke 390 positioned between the Kawasaki Ninja 300 and Honda CB 500F. 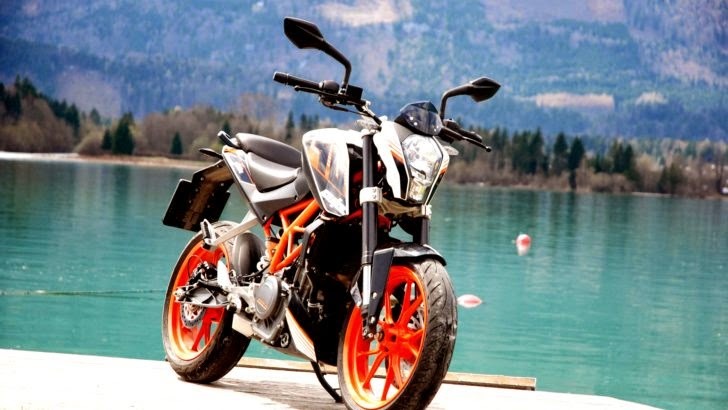 If the same strategy is adopted in Brazil and the volume of production to meet the demand, the KTM Duke 390 can repeat here the success it has done in other markets.